Midnight Sun is a compilation of studio recordings. Most tunes feature Heikki Koskinen's arrangements of original & Finnish tunes with Heikki on piano, wind player Steve Heckman, and percussionist Michael Spiro. 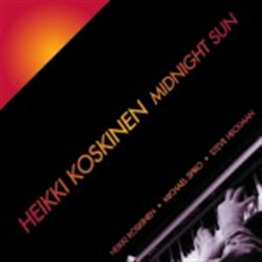 The older recordings feature Heikki's 80's bands, with musicians such as sax players Hadley Caliman and Steve Heckman, pianists Mark Soskin and Neal Kirkwood, bassist Heshima Williams, and drummer Larry Hancock.